At the 24th meeting of Conference of Parties (COP-24) to the United Nations Framework Convention on Climate Change on Monday, Union Environment Minister Dr Harsh Vardhan reiterated India's solar and public awareness campaigns like Green Good Deeds. 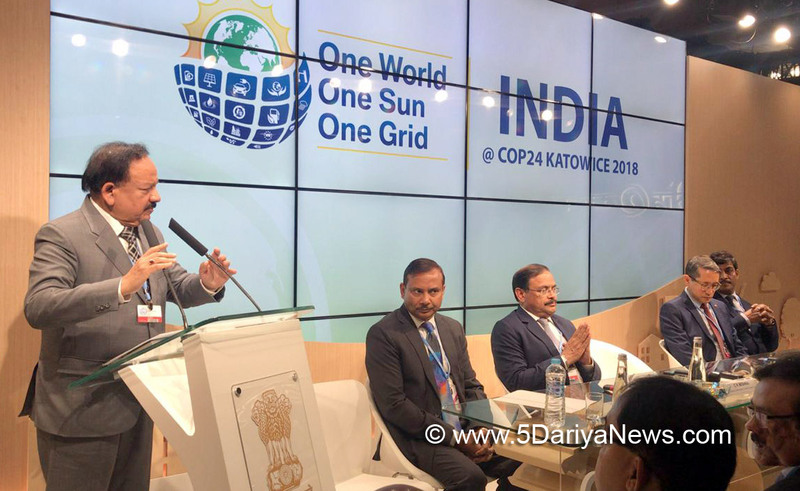 "This year the theme of India Pavilion is 'One World One Sun One Grid' as highlighted by Prime Minister Narendra Modi during the first assembly of the International Solar Alliance in October 2018," Vardhan said at the inauguration of Indian Pavilion in COP-24 in Katowice, Poland.The Minister also stated that Indian leadership resolves to make India plastic-free by 2022. "I expect that this movement - Green Good Deeds - will soon involve people not only, in India but across the globe. I am receiving positive feedback from all stakeholders for further strengthening this movement," Vardhan said.He said India is working hard for achieving the 175 GW target for installed Renewable Energy capacity by 2022. "The effect of increased use of renewable energy is now visible in India. Resultantly, India stands fourth in wind power, fifth in renewable power and solar power installed," the Minister said adding that the government is also working on biomass, biofuel and bio-energy.Vardhan said that until now, more than 0.26 million Electric Vehicles have been sold, which has led to more than 91 million (in kilogram) CO2 reduction.Green Good Deeds is a campaign initiated by Vardhan that encourages people towards the environment by planting trees, power saving, transport and household that can improve the deteriorating environmental conditions.